is also used for the dangles and the hook clasp. BA looks very similar to Silver, but does not have the tarnish problems, there can be some slight greying over time but a quick wash and rinse brings it back up to Top Sparkle. 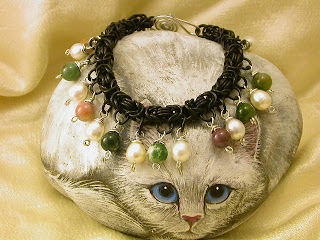 The beads are agate and jaspers in greens, mauves and pinks with gorgeous 8 mm or larger freshwater pearls.